With over 50 stores in eastern North Carolina and southeastern Virginia, Duck Thru is a favorite with locals and visitors alike. Our Duck Thru convenience stores proudly offer quality Shell® and Duck Thru fuels gasoline in Regular, Mid-Grade, and Premium grades, as well as Ultra Low Sulfur Diesel Fuel. We also carry a wide range of food, snacks, and beverages – everything you need to refuel and recover!  Duck Thru Food Stores is a family owned business and prides itself in treating customers and staff like members of their own family! In 1983, James “Duck” Harrell opened his first convenience store, Duck Thru Food Store #1, located in Murfreesboro North Carolina. In 2006, Michael and wife Billie-joe Harrell acquired Jernigan Oil and Duck Thru Food Stores from “Duck”​ and Jerri. At the time of acquisition, “Duck”​ had built and acquired more than 24 convenience stores, marking Duck Thru as the largest family owned convenience store chain in Eastern North Carolina. 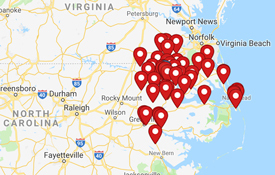 Since, Michael has continued to grow the business with more than 50 locations in Southside Virginia and Northeast North Carolina. Jernigan Oil Company was founded by L.S. Jernigan Sr. and his son L.S. Jernigan Jr. in June of 1948. Jernigan Oil Company is still owned and operated by members of the family, with Michael Harrell serving as President today. Michael is a fourth generation family-owner and succeeds his father James “Duck”​ Harrell. “Duck”​ and his wife, Jerri Harrell owned and operated the company from 1982 to 2006, with “Duck”​ serving as President for all 24 Years.